When Officer Adil Polanco dreamed of becoming a cop, it was out of a desire to help people not, he says, to harass them. “I’m not going to keep arresting innocent people, I’m not going to keep searching people for no reason, I’m not going to keep writing people for no reason, I’m tired of this,” said Adil Polanco, an NYPD Officer. Officer Polanco says One Police Plaza’s obsession with keeping crime stats down has gotten out of control. He claims Precinct Commanders relentlessly pressure cops on the street to make more arrests, and give out more summonses, all to show headquarters they have a tight grip on their neighborhoods. “Our primary job is not to help anybody, our primary job is not to assist anybody, our primary job is to get those numbers and come back with them?” said Officer Polanco. This audio recording exclusively obtained by Eyewitness News seems to back up Officer Polanco’s assertion of a quota. You can listen to one officer as he lectures his rank and file officers during roll call at the 41st precinct. “We are stopping kids walking upstairs to their house, stopping kids going to the store, young adults. In order to keep the quota,” answered Officer Polanco. Policing is an industry, and the people involved with it have an interest in being able to show how nessesary they are – the easiest way being that they can point to statistics of how many people were stopped/cited by officers. This is on a slightly similar note as the study published last year in the Journal of Law and Economics that confirmed that local governments increase traffic citations purely to offset other reductions in revenue. I recommend reading “Arrest Proof Yourself”. The author, an ex-cop, ex-FBI and defense lawyer says that while there may not be quotas, cops who don’t make arrests, don’t get promotions. Subjects, not citizens, just as with health care. Here is a Google Books link to “Arrest Proof Yourself”. Simple solution is a point system based on quality, not quantity. Sad but true. And the really sad thing is that while the cops are out arresting people willy-nilly people that really should be arrested are wondering about creating havoc. How many years did Bernie Madoff run around?? Try going home to the wife and kids with a bite wound, scratches, bruises, knife scars, chemical burns, needle marks, bullet injuries. Try telling a middle aged couple that you found their son’s body. Police work isn’t all donuts and car chases. #8: And that’s an excuse for higher ups forcing beat cops to harass and imprison innocent people so their numbers look good to politicians wanting to appear tough on crime? By that measure, they should be shooting innocent people and planting guns on them to prove how tough they are on violent crime. Oh wait… some cops do that already. The bigger problem is that most organizations (whether government / private) measure performance to metrics. However, when you measure performance to metrics too heavily you often realize there are unintended consequences and you get things you did not desire nor anticipate. Use metrics sparingly. In the case of the police officer, these quotas seem to have been “informal” so the brass pushing these quotas are going to get burnt (unless they were directed by a higher authority that the brass will rat out to CYA). If it’s not on paper, the real culprit may have plausible deniability (which I’ve seen when military officers burn enlisted people for following their vague orders to cover their own rears). What ever happened to false arrest charges? What ever happened to the right against unreasonable search and seizure? Are we so hypnotized by the shiny badge that we have lost all reason? Sociopaths provide security ‘cos they like to wear uniforms and carry guns. The penalty for intentionally arresting innocent people should be criminal and very severe. We entrust cops with the power to destroy people’s lives all the way up to death. This his huge. The penalty for violating these rules needs to be equally huge. Is anyone really surprise by this? LA is probably by far the biggest offender. Check their revenue for he last 3 years. My hometown of San Diego is seeking to do the same thing, purely for financial reasons of course. I do not believe this story. 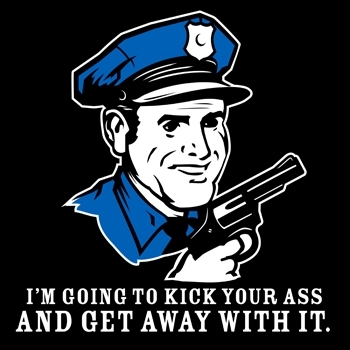 I do not believe any police officer in my United States would stoop to such tactics just to meet a quota. Mostly those things only work for those who have thousands of dollars to spend on lawyers. The bigger the city, the better idea it is to stay away from it. New York and L.A., being the biggest cities, don’t deal with individuals, they deal with masses, with large numbers. In this system, just as elsewhere, the rarest thing is the attention of a human being who has any power (or inclination) to help you. It’s as true for cities, police, courts, jails, prisons as it is for “customer service” call centers. If you don’t have a few thousand bucks to get the attention of a lawyer who can get the attention of a judge or prosecutor, you’re like chaff in the wind. Yeah, you have to fly a plane into a building to get anyone’s attention nowadays. #17: Your good fairy obviously never lived in a big city. If you don’t believe this story, you would never believe the things that went on in Milwaukee while I was growing up there. They make this look like getting arrested for spitting. Bad Behavior has blocked 19331 access attempts in the last 7 days.